Calcite, CaCO3, gets its name from "chalix" the Greek word for lime. It is one of the most common minerals on the surface of the Earth, comprising about 4% by weight of the Earth's crust and is formed in many different geological environments. Limestone, a sedimentary rock, becomes marble from the heat and pressure of metamorphic events. Calcite is even a major component in the igneous rock called carbonatite. Dolomite, CaMg(CO3)2, is a common sedimentary rock-forming mineral that can be found in massive beds several hundred feet thick. They are found all over the world and are quite common in sedimentary rock sequences. All dolomite rock was initially deposited as calcite/aragonite rich limestone, but during a process call diagenesis the calcite and/or aragonite is altered to dolomite. Calcium carbonate is a salt with ionic bonds between the calcium +2 cations and the carbonate -2 anions. There are strong, covalent bonds within the CO32- group. The carbonate minerals have a structure that is similar to the cubic close packed structure found in halite (NaCl) where the Na cations are replaced by divalent cations (Ca, Mg, Fe, Mn, Sr, Ba, Pb, etc.) and the Cl anions are replaced by CO32- polyatomic trigonal planar ions. Think of the ions as being located on two face-centered cubic lattices that interpenetrate one another. Minerals in the carbonate group differ do not have true cubic close packed symmetry because anions and the cations differ significantly in size. They are distorted from this type of crystal form. Click here for a full listing of carbonate minerals. 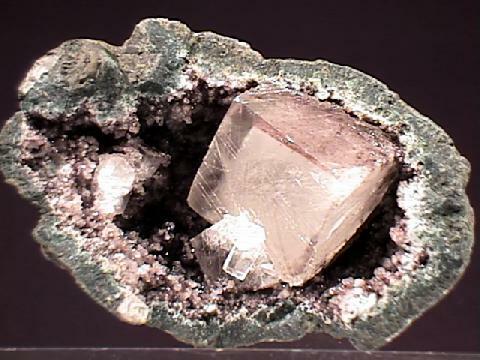 Calcite is one of the most abundant of the non-silicate minerals. Pure calcium carbonate is colorless but, because it dissolves in acidic water and can recrystallize with different inclusions, calcite has many forms and colors in nature. 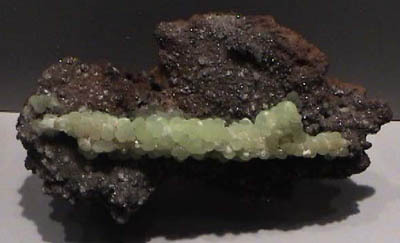 Smithsonite is a carbonate mineral of zinc. 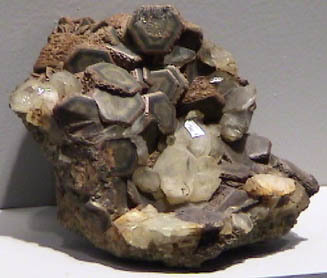 A typical structure for Smithsonite has the appearance of grape clusters. The form is called "botryoidal", and in large samples has the appearance of a bubbly landscape. It is a minor ore for zinc. Siderite is a carbonate mineral of iron. Some forms of siderite are plate-like, or globular with thin, plate-like petals. Other samples have cubic crystals. Magnesite is a carbonate mineral of magnesium. Of all the common carbonate minerals, calcium carbonate is most soluble. The solubility of CaCO3 depends on the polymorph. At 25 degrees, the Ksp for calcite and aragonite (the most common polymorphs of CaCO3) are 10-8.48 and 10-8.34, respectively. Click here to see solubility product constants for other minerals. All carbonates have some water solubility and dissolve readily in acidic water. They dissolve in acidic water and can recrystallize from the water. Metal ions are frequently trapped in the lattice spaces during crystallization. This leads to carbonates with a variety of colors and crystal forms. Carbonic acid-rich water forms caves in limestone. When the water table is high, carbonic acid-rich water dissolves the limestone (calcite). Later when the water table drops, a void filled with air is formed. Smaller amounts of water rich in Ca2+ and HCO3- may continue to flow through the void. These waters decrease the CO2 partial pressure in the atmosphere of the cave and aqueous CO2 is released into the gas phase. This increases the pH and drives the precipitation of calcite and formation of stalagmites, stalactites and other cave features. How stable are these solids? Salts containing the carbonate anion decompose with loss of carbon dioxide. This is an endothermic reaction and produces metal oxide materials. The carbonates are more stable, in general, with larger cations.